We hope you’ll join us for worship at St. Stephen’s! If you are already an Episcopalian, you probably know what to expect. 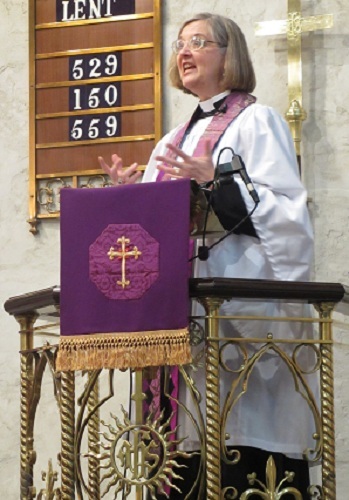 If you’re new to the Episcopal church, you might have some questions. 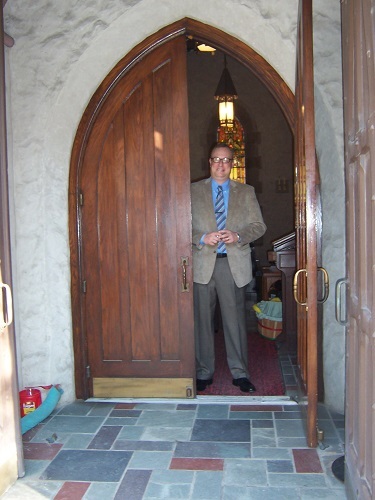 Click here for a wonderful introduction to how Episcopal churches approach worship. Our St. Stephen’s FAQ also provides some helpful basics. And here are a few additional notes to aid your worship time with us. Our 8 am Sunday service is a quiet, intimate service without music. 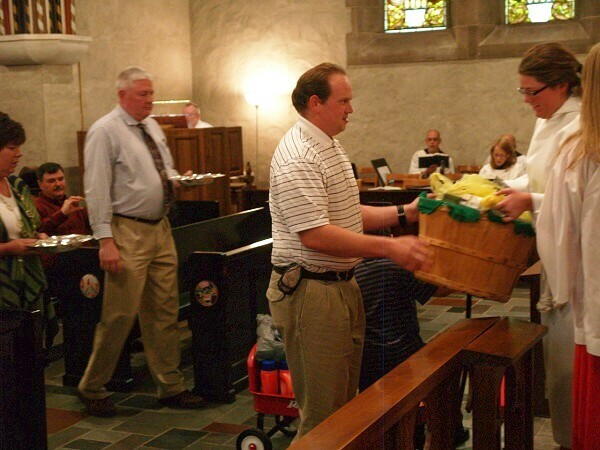 The 10 am service typically features an organ and choir and sometimes other forms of music. 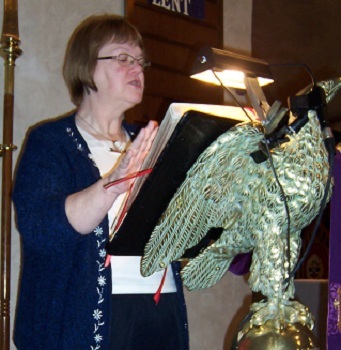 Both services make use of the Book of Common Prayer, usually Rite 2, and newer resources like Enriching Our Worship. As you walk in the door, you’ll be greeted by an usher who will give you a seasonal service leaflet plus a weekly insert to tuck inside. Together, they’ll outline the service for you. The usher is also there to help you find your way around. Don’t hesitate to ask about the restrooms or resources for your kids. As you find your seat, you will notice that some of us kneel in prayer and others simply sit quietly, preparing our hearts and minds for worship. Whatever works for you is fine, but we ask that you keep your voice low. We also appreciate your turning your cell phone off when entering St. Stephen’s. 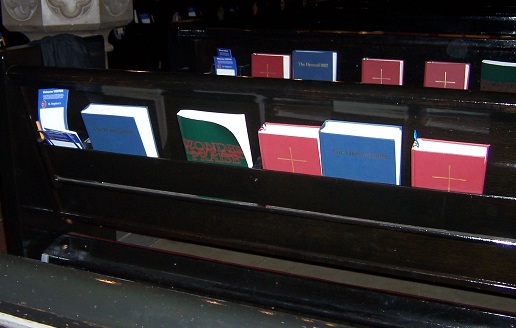 You’ll notice racks full of books in the backs of the pews—blue hymnals, green supplemental hymnals called Wonder, Love & Praise, plus red-covered copies of The Book of Common Prayer. Your service leaflet works with these books as well as the Bible to make worship user-friendly and minimize the need for “book juggling.” But feel free to spend time leafing through the books. We believe you’ll find them a rich spiritual resource. You’ll probably notice that there is a lot of sitting, standing, and kneeling during the services. You may also see people bowing at certain times or making the sign of the cross. We Episcopalians believe in worshiping with our bodies as well as our minds and spirit. However, you’ll also note that not everybody does the same thing, so feel free to worship in a way that feels comfortable to you. If you’re curious about why we make certain gestures and what they mean, you may find this helpful. You will notice changes from week to week and month to month as we move through the seasons of the church year. Worship during the preparatory seasons of Advent and Lent looks and feels different from the joyful celebration of Easter day or Pentecost. (Check out our glossary—or click here for a more extensive explanation of these special words.) Colors, sounds, the movement of light, all engage the senses and enrich the experience of worship. 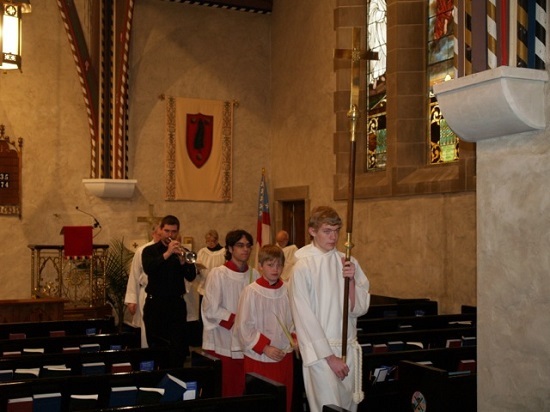 Some Episcopal churches use incense as well. Our current priest prefers not to use incense out of concern for those with allergies and respiratory ailments. It’s one way we can be hospitable to the stranger. Please know that, as a visitor, you will not have to stand up in front of everyone or be singled out. We ourselves will stand and may shake your hand during the Peace, and some of us may come up before or after the service and introduce ourselves, but during the service we will simply consider you one of us. We do hope you will identify yourself as a visitor to an usher or to someone sitting near you and will sign our guest book in the back of the nave or complete a blue visitor’s card in the pew rack. (If you already visited and forgot, click here for a PDF version you can print out, fill in, and either mail to us or bring on your next visit.) We do want to get to know you, but we don’t want to pressure or embarrass you! Our deacon prepares the communion. The priest then begins a prayer we call the Great Thanksgiving. It begins like a conversation back and forth between the congregation and the priest. Some people will kneel partway through.The priest is actually praying on behalf of everybody present. We remember God’s faithfulness ever since creation. We remember our history through many generations as God’s people. We remember the night Jesus sat with his friends, took bread, blessed it, broke it, then shared the bread and a cup of wine with them. The prayer is filled with deeply symbolic language. The priest asks that by this bread and this wine we might become one Body. Then we affirm everything the priest has prayed on our behalf with a great AMEN. In a quiet and orderly way people move forward to receive the bread and/or wine. (Detailed instructions are in the service leaflet.) We find that this act of thanksgiving that we call Eucharist has a mysterious power to bring us together, nurture our faith, and make our hearts more loving and peaceful. Don’t Rush Off After the Service! 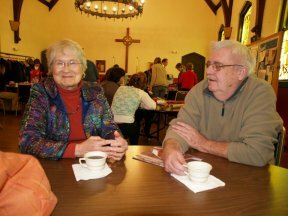 You’ll note that many parishioners like to sit quietly in the pews after the dismissal, especially if there is an organ postlude. You may choose to do this or simply rise to leave. (Please keep your voice down out of courtesy to those who like to use this time for quiet reflection.) But don’t skip the coffee hour in the Great Hall after the service! We really hope you’ll join us for coffee, tea, square donuts (yes, that’s a “thing” in Terre Haute), and conversation. You may even be asked out to lunch! We hope to see you at St. Stephen’s. Come join us! May the peace of Christ be always with you!